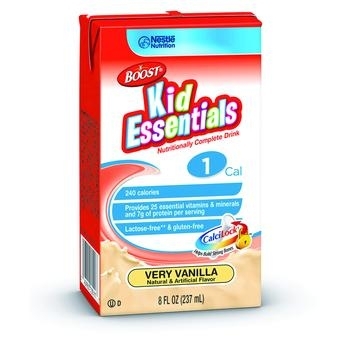 Nestle Boost® Kid Essentials is a specially designed formula and packaging for children ages 1-13. Nestle Boost® Kid Essentials is a specially designed formula and packaging for children ages 1-13. Contains CalciLock™ blend of essential nutrients, including calcium and Vitamin D, to help support healthy bone development. Nutritionally complete formula for tube feeding or oral use.